Graham Budd Auctions held their 2nd Sporting Memorabilia auction of the year over two days last week, 7 and 8 November. At first glance there were no obvious rowing lots on offer but on closer inspection there were two with rowing connections worth recording on HTBS. 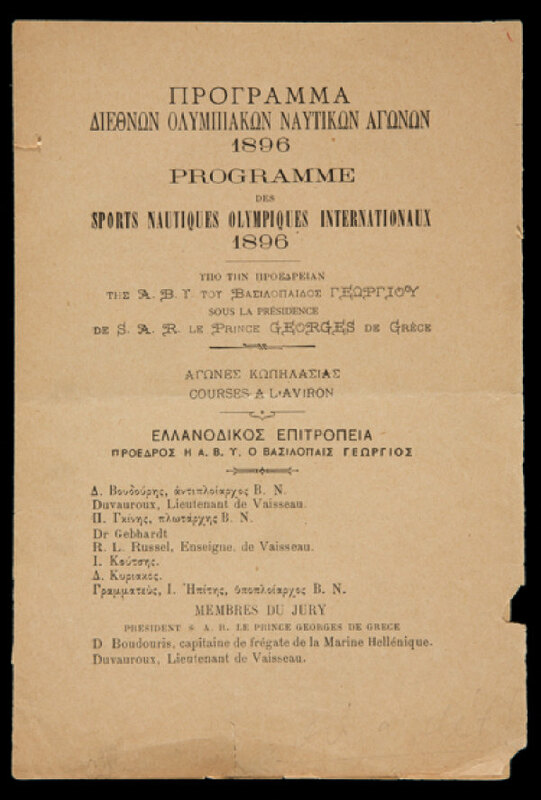 Lot 593 – Rare Athens 1896 Olympic Games Official Daily Programme for Nautical Sports, April 13, 4-pager. Estimate: £2,000 – £2,500. Photo: Graham Budd Auctions. This lot failed to find a buyer; perhaps the estimate was too high for a regatta that, according to official records, did not take place but which for some of us is the true origin of Olympic rowing. The other lot with a rowing connection also failed to find a buyer. The ‘rowing’ link is very weak but it does allow me to introduce HTBS readers to a graceful Greek goddess. Lot 598 – The Charles Bartlett London 1908 Olympic Games 100km Cycling Champion Collection. 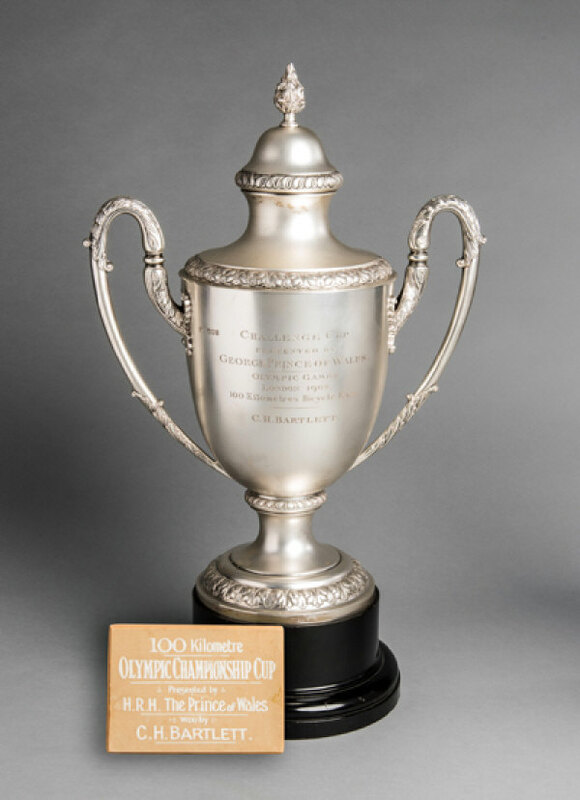 The Prince of Wales’s Challenge Cup, Presented by George Prince of Wales [later King George V], Olympic Games, London 1908, 100 Kilometres Bicycle Race, C.H. Bartlett, Estimate: £25,000 – £30,000. Photo: Graham Budd Auctions. This lot comprised of several pieces belonging to Charles Bartlett, winner of the 100 kilometres bicycle race at the 1908 Olympic Games, including his Olympic Games gold medal, the above trophy and plaque, his GB competitor’s vest and a silver medal from his cycling club, Polytechnic Cycling Club, to commemorate his Olympic achievement. 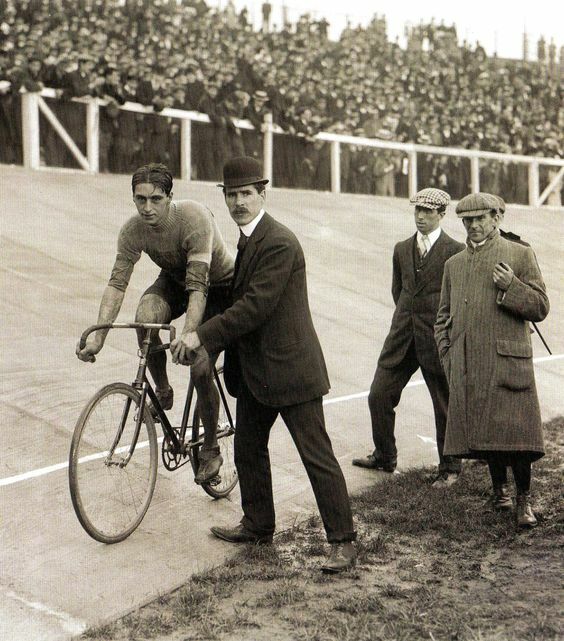 A wonderful photograph of Charles Bartlett, Great Britain, 1908 Olympic gold medallist in the Cycling 100 km track event. Photo: Pinterest. The Prince of Wales’s Cup for Cycling was one of twelve challenge trophies presented to winners of various events at the 1908 Games. The rowing connection is that one of these challenge trophies was presented to the winners of the eights race and was called “The Brunetta Statuette for Rowing”. Speech by Lord Desborough of Taplow, IOC member, during the medal ceremony for rowing in Henley-on-Thames. The Brunetta Statuette can be seen on the table in front of Lord and Lady Desborough. Photo: IOC/Olympic Museum collections. At the conclusion of the regatta on 31 July, there was a grand medal ceremony, near the grandstand, with music provided by the drums and bugles of the Irish Guards. 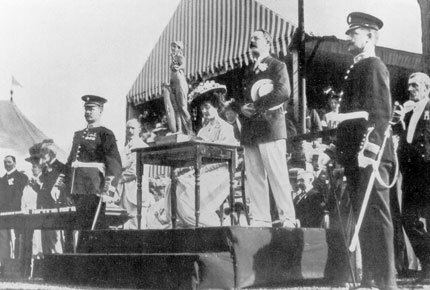 The winners of each event received Gold Medals from Lady Desborough, Silver Oars from the Mayor of Henley, Mr. W. Anker (I kid you not, GD) Simmons, and his wife, and personal and club diplomas. Silver and bronze medals were not awarded, but all competitors, other than winners, received Olympic Commemorative medals, and members of the Management and Reception Committees received commemorative medals from Pierre de Coubertin himself. 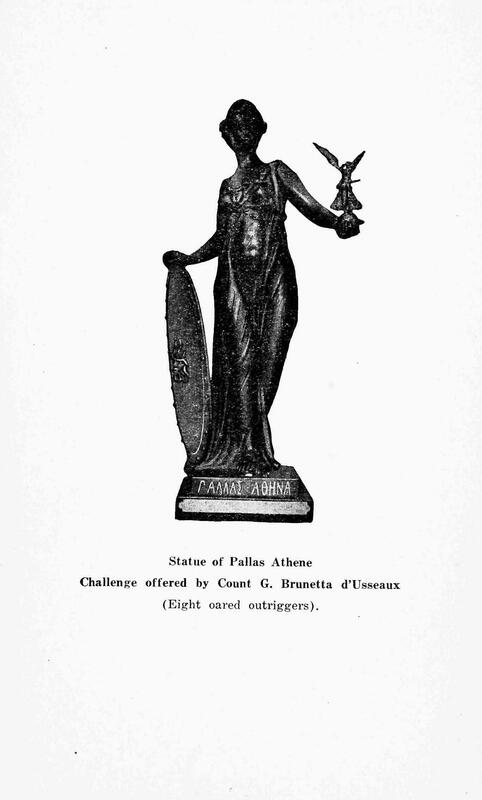 On display from, 29 July was the Statuette of Pallas Athena presented by Count Brunetta d’Usseaux, Secretary of the International Olympic Committee. The Count had originally proposed that this be awarded to ‘the nation scoring the greatest number of events’. This was seen as impractical, even iniquitous, and it was ultimately decided to award it to the winner at each Olympic Games of the eights. 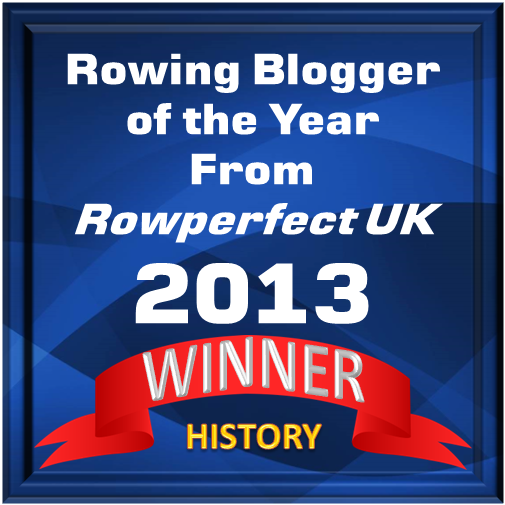 The first holder of the trophy was the Leander Club crew, one of two British eights selected to represent Great Britain. In the final, they beat Royal Club Nautique de Gand representing Belgium. 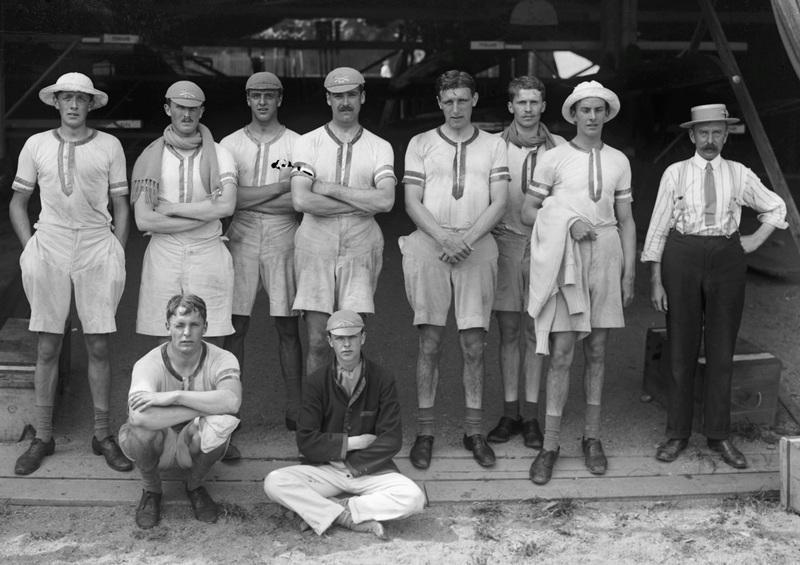 Leander Club/Great Britain, winners of Olympic Gold and first winners of The Brunetta Statuette. The 1908 Olympic Games were originally awarded to Rome but following an eruption of Mount Vesuvius on 4 April 1906, the Italian Government withdrew financial support for the Games stating that all available funds were needed to provide relief to those around the Naples area affected by the volcano. Count Eugenio Brunetta d’Usseaux whom Wikipedia state was ‘an active rower and a rider’. Photo: Quotidiano Piemontese. 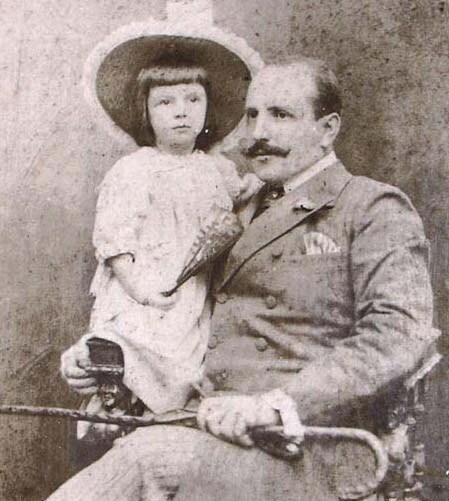 Count Eugenio Brunetta d’Usseaux, Italian International Olympic Committee member had the unfortunate job of informing the International Olympic Committee of his country’s withdrawal. The committee was meeting in Athens prior to the commencement of the 1906 Anniversary Games and also there for the Games were Lord Desborough, King Edward VII and other members of the British Olympic Association. Together they agreed in principle that London would offer to host the Games. With the agreement of various sporting bodies in place, a British Olympic Council was formed as an organising committee and the IOC formally notified. 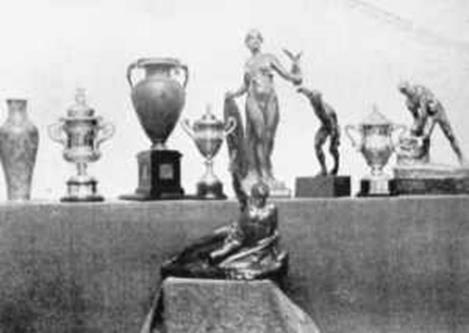 Count Eugenio donated two of the challenge trophies presented at the 1908 Games; The Brunetta Statuette for Rowing and The Brunetta Trophy for Swimming. 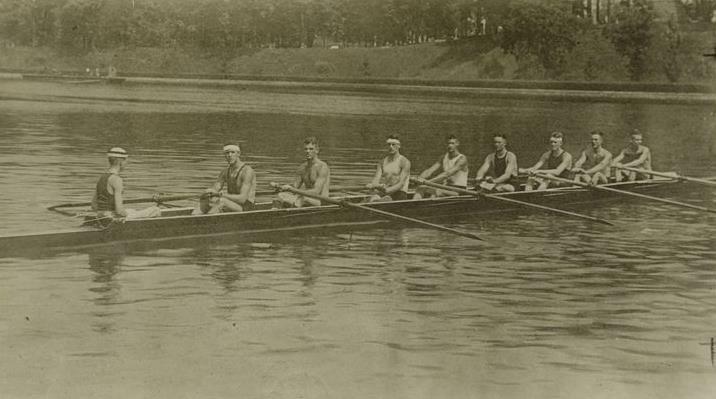 Those wonderful people at The River and Rowing Museum caught up with a rower from the 1908 Olympics gold medal crew and recorded an interview in which he describes the training, diet and recovery the crew employed to see off Johnny Foreigner. Watch What makes an 1908 Olympic rower? and all will be revealed. Some of the challenge cups and trophies presented at the 1908 Olympic Games. The cycling and rowing trophies in the centre and The Greek Trophy for the Marathon Race, presented to Johnny Hayes to the fore. U.S. athlete Johnny Hayes finished second in the 26 miles 385 yards marathon but was declared the winner after Italian Dorando Pietri was disqualified after receiving assistance from the race umpires inside the Olympic Stadium. 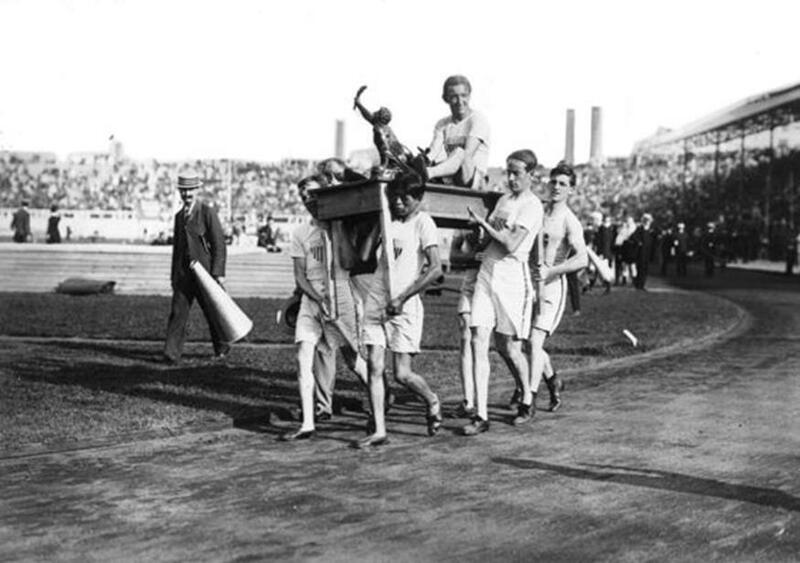 In the above photograph, Hayes and his trophy are carried on a table by his teammates after his victory. You can watch the finish of the race here. With World War I raging in Europe, the 1916 Olympic Games were cancelled but in 1920 the trophy (described as a ‘Challenge Cup’ in the rowing programme) was again offered as a prize for the winners of the eight-oared outrigger event. 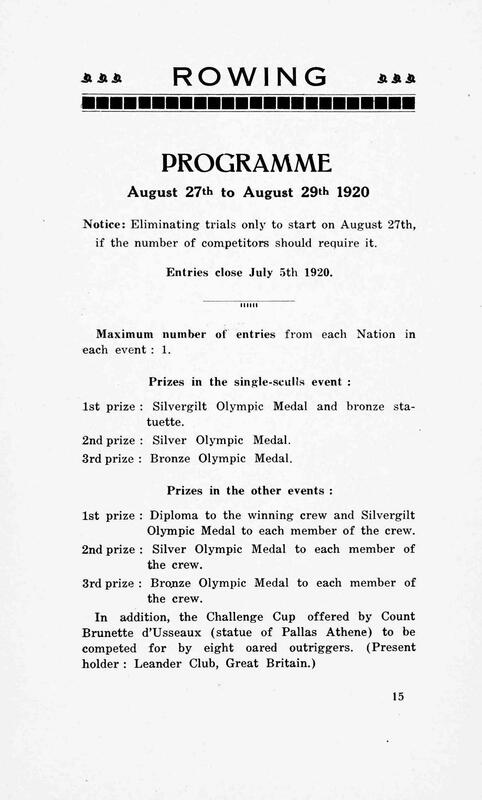 A page of the programme for the rowing events at the 1920 Olympic Games held in Antwerp confirming Leander Club as the holders from the previous Games which were held in 1912. The United States of America beat Great Britain in the final and took home the Pallas Athena Statuette to Annapolis, Maryland, home of the winning U.S. Naval Academy crew. The Naval Academy crew that represented the USA at the Antwerp Olympics, winning gold and capturing the Brunetta Statuette for America. The USA did not lose the Olympic eights title until 1960 when they were beaten by a unified team from Germany. Photo: Vintage Sports Pictures. A photograph of the The Brunetta Statuette, ‘ΠΑΛΛΑΣ ΑΘΗΝΑ’ from the 1920 Olympic programme. What price would this fetch if it came up for sale? We, the undersigned, having been awarded the Challenge Cup for ……………. at the Olympic Games of London on July 25, 1908, and the same having been delivered to us by the British Olympic Council, do hereby individually and collectively engage to return the same in good order to the British Olympic Committee on or before January 1, 1912, in accordance with the Rules of the International Olympic Committee, and to be responsible for, and to repair all damage that may occur to the same between July 25, 1908, and January 1, 1912; and if at any time before January 1, 1912, the International Olympic Committee shall have ceased to exist, we hereby engage to send back the Cup to its original donor through the representatives of the British Olympic Committee appointed for that purpose. The remaining four trophies (Marathon, Gymnastics, Discus and Yachting) were left to the care of the International Olympic Committee, to whose charge they were committed for future Games. I can find no mention of Pallas Athena or The Brunette Statuette for Rowing in the official Olympic Reports for either the Paris Games of 1924 or the Amsterdam Games of 1928. So, what happened to this iconic trophy? HTBS readers, Poirot needs your help. The statue was held by the winning eight until the next Olympic Games. It was awarded at the 1908 London Games, the 1912 Stockholm Games and the 1920 Antwerp Games. 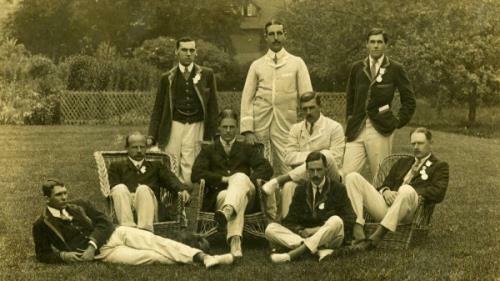 At the 1908 Olympic Games in London it was presented to the victorious Leander Club eight by Lady Desborough. Great Britain won the gold medal again in 1912 but the statue has not been in this country since. Very helpful Eloise, thank you.